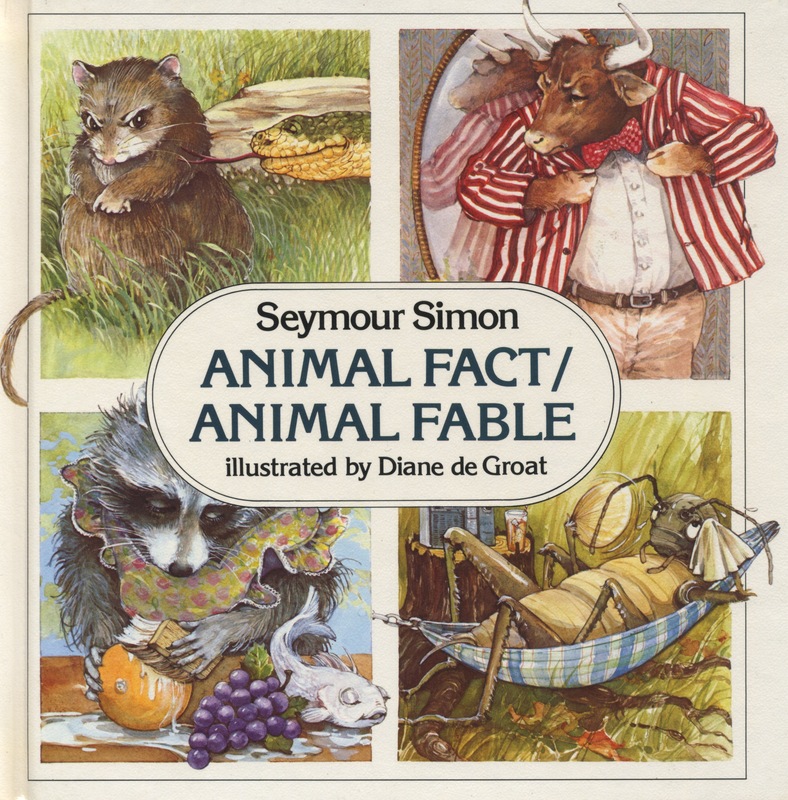 An old favorite, Animal Fact/Animal Fable, has recently been reissued in a Kindle edition! In this book, there is information about twenty commonly held beliefs about animals. Among them are: an owl is a wise bird, bats are blind, and bulls get angry when they see red. On one page, the reader is invited to guess if the statement is a fact or a fable. On the reverse side, there are two paragraphs about this feature of the animal’s behavior. In the case of the fables, one paragraph posits how this misunderstanding came about and explains the truth, and the other paragraph provides additional detail on that subject. I guarantee there will be some surprises! The whimsical illustrations by Diane de Groat appeal to a child’s sense of humor. The owl holds a report card with straight A’s in hooting, night flying, roosting, nest building and mouse catching. Four bats hang from a branch wearing dark glasses and holding white canes. For the very literal minded youngster, it does need to be made explicit that all of the illustrations are fables; what the reader is making a decision about is the veracity of the statements. This book has been a favorite of my students in second and third grade. I love it too because it can be used in so many ways. Third graders have used it for examining good paragraph structure. They sequence the separate sentences in a paragraph, noting how the signal words and referents indicate the connections between ideas, and thus provide clues about the correct order. Second graders have adopted this model for their own animal research reports. After making a statement and asking the reader to judge whether it’s a fact or a fable, they have proceeded to write a paragraph or two about their findings on one topic in their animal’s life. This book is also valuable in moving students of the perfectionist, competitive variety towards an understanding that mistakes provide an opportunity to learn something new. This entry was posted in Recommended Books on May 1, 2014 by lwhulbert.